The scene: the onstage battle at the American Crossword Puzzle Tournament between five-times-in-a-row winners Dan Feyer and Tyler Hinman. Howard Barkin added a wild card to the mix, making his fifth trip to the big boards (once as a C finalist). Tyler radiated a renewed hunger to take back the title, racing to fill in letters. In contrast, Dan solved with methodical speed. In the end, the result was the same. Within less than eight minutes, they both had just a few letters to go. And I honestly wondered if we’d see the first tie in tournament history. Flashback: Earlier in the week, I’d been up in my attic and came across several bundles of soccer jerseys. I’d been in charge of distributing them years ago for a youth league my daughter took part in, and I’d thrown the bags of unused extras up there. 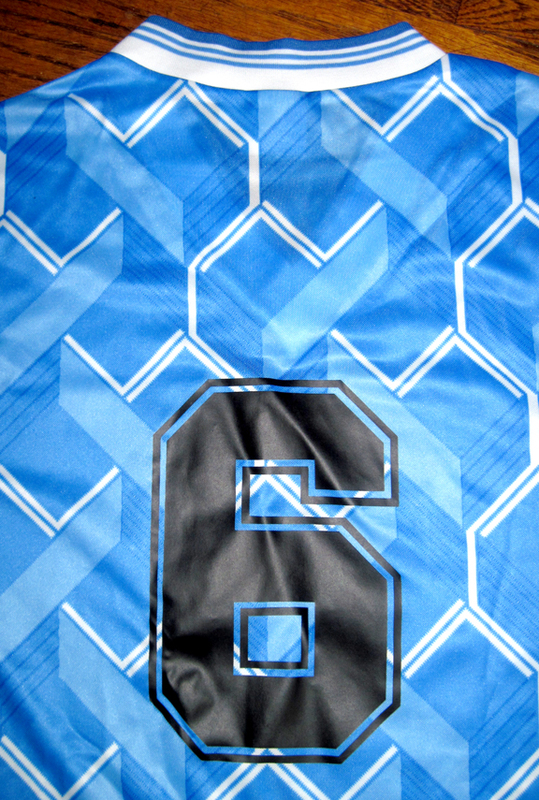 I rummaged through the bags and pulled out two jerseys, both with a #6 on the back. There were just the two of them, one orange and one blue. I thought Dan might get a kick out getting one of them if he pulled off a sixth victory (even if it did say Eastchester Youth Soccer on the front). But then it struck me, Tyler would be going for a sixth as well. So I stuffed both in my suitcase. The more I thought about it, the more it seemed like fate that I’d found two of them. Could there be a tie, with a jersey for both? Flash forward: Dan’s and Tyler’s hands didn’t go up simultaneously. But it was pretty damn close — the second one shooting up just as the first was finishing. I was thrilled to see Dan earn his sixth title. He’s a great guy, a friend, and a fantastic solver. But I also really felt for Tyler, who is all of those things as well. We’ve all had those moments in life when we really wanted something, and it didn’t happen. It seems even more painful when it’s so close you can feel it. I could say many complimentary things about Tyler, both as a person and as a competitor, and they’d all be 100 percent true. Unfortunately, there are times when saying those things can help a little … but not nearly enough. p.s. I did end up bringing one more jersey to the tournament, a red one with a #1 on the back. I gave it to Nancy Schuster, the very first winner of the tournament 38 years ago. This entry was posted on Monday, March 30th, 2015 at 10:24 am and is filed under Crosswords, Puzzles. You can follow any responses to this entry through the RSS 2.0 feed. You can leave a response, or trackback from your own site.